GALVESTON, Texas - At one time, Galveston was Texas' largest city. It had the state's first private bank, first Navy base, first locomotive, the busiest port and the state's first golf course in 1898. It also suffered through the worst natural disaster in U.S. history. Back before hurricanes had names, the Great Storm of 1900, estimated to be one of the most powerful on record, claimed more than 6,000 lives. Homes were swept into the Gulf of Mexico, businesses were flattened and this once bustling city lay in ruins. Among the victims was Galveston Country Club, a minor footnote in the overall scheme of tragedy, but the island went without a golf course for more than a dozen years as it rebuilt. The Storm signaled a change in Galveston's stature. The port of Houston was soon dredged and Galveston looked up to the development to the north as Houston grew into the fourth largest city in the country. Industry moved north and the beachfront city of 65,000 - named for the Spanish colonial governor and general, Bernardo de Galvez - became a tourist town, presenting a quaint refuge for mainland Texans looking for a quick weekend getaway. The beaches and shops are plentiful and this still largely under-developed resort town offers its own brand of charm. There's the Strand, which every February hosts its own crazy Mardi Gras celebration. It's not quite on par with the French Quarter of New Orleans, but it gets pretty wild. In December, there's the annual Dickens on the Strand, a considerably tamer Christmas celebration. There's also Moody Gardens, the Moody Mansion, the Bishop's Palace, a slew of other historical buildings and graveyards, the Railroad Museum (which does a great job chronicling the Great Storm), some killer seafood joints and the Lone Star Flight Museum, which is one of the best of its kind anywhere. There's also plenty of fishing both offshore and on, water sports and even surfing - if you don't mind the waves a little on the small side. If all that sounds good and you are a golfer, bring your sticks. There's public golf on the island and it's worthwhile. 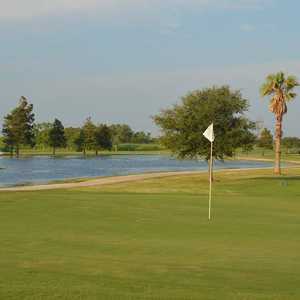 Surrounded by Sydnor Bayou in between Moody Gardens and Scholes International Airport, the par-72, 6,900-yard Galveston Municipal Golf Course is a great way to round out a weekend of going to the beach, shopping and sightseeing on the island. The course presents a pretty stiff test on most days for the most accomplished players and is interesting enough for everyone. "It's a really nice golf course … a well-kept secret," said head professional Joe Russo, who's been a big part of the old golf course's resurgence since a redesign in 1989. "And the greens are in great shape." That would have been a lot to ask for 18 years ago, before it closed down for the renovation. Back then, island residents either had to be a member of Galveston Country Club or leave the island to find a decent golfing experience. It hadn't always that way, though. Galveston's first muni can be traced back to the 1930s where the airport sits now. Believe it not, it was a Donald Ross design, but when World War II broke out, priorities changed and the golf course was razed to make room for an Air Force base. "Only in Galveston would you tear up a Donald Ross course," said Russo, laughing. It would be another three years until public golf returned when the city bought Galveston Country Club's course on 61st street. That eventually gave way to a shopping center, of course, and the new muni was constructed in its present location in 1976. But that course barely resembles what sits there now. Flat greens and tees with little definition of holes is what Galveston Municipal offered before 1989. Then a group of citizens rallied to borrow $1.3 million for a makeover. Designed by the late Carlton Gipson, the new course opened to rave reviews and though it shows a little wear over the past 16 years, it has stood the test. (The loan, by the way, has since been paid off). With water in play on 14 holes and an ever-present ocean breeze (the course is just a few hundred yards from the seawall), greens are well guarded by bunkers and water hazards, however there's plenty of room to maneuver the ball off the tee on most holes. The hardest hole is the par-4 fourth, Russo said. At 440 yards and water fronting the green on the approach shot, it plays especially tough into a north wind. It's no bargain downwind either. In fact, after the first two holes, nothing comes easy. A variety of difficult par 3s and par 4s with par 5s that make you assess risk and reward will keep you from getting bored. The course ends with a 410-yard par 4 with water about 250 yards off the tee that forces you to carefully place the tee shot. Then it's all carry to an elevated and well-protected green. "The golf course changes every day," said Russo, who had a lot of input into Gipson's redesign. "It never plays the same because of the wind." Which is why playing Galveston Municipal is worth an occasional trip to the island. 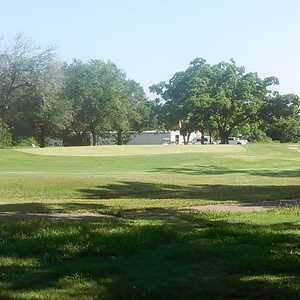 For a little more upscale experience, you might want to try Magnolia Creek Golf Links in League City, located about 30 miles north on I-45. The 27-hole layout features three links-style nines - England, Scotland and Ireland - of rolling hills, deep, entrenched bunkers and native grasses. While you may not think you're on the British Isles - especially when it's 90-plus degrees six months out of the year - you'll need your knockdown technique. With nary a tree to be found, winds are usually two clubs or better. But the fairways are wide and the greens are big and usually run true, so there's plenty of room to hit the ball. A-1 practice facilities and a top-notch grill round out the experience. It's a little out of the way, but Rio Colorado Golf Course is well worth the journey. "It's a fair test for everyone and away from the big city," said teaching professional Denise Klaus, "Pace of play here is wonderful. You can get away and get in a four-hour round of golf." 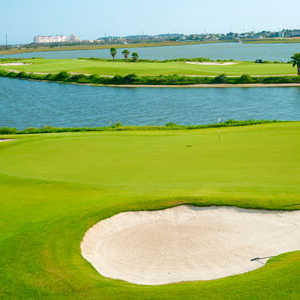 As the name implies, this Gary Player design, located about 40 miles northwest of Galveston just southwest of Bay City, meanders around the Colorado River, which eventually empties about 15 miles south of the course into the Gulf. Course conditioning is above average and the holes, many of which are guarded by water, bunkering, native grasses and trees, are more than up to the challenge. The course eases you in on the front nine, but it gets more difficult as you move along. For example, the par-4 finishing hole plays 474 yards from the back tees and is usually into the wind with water down the left side of the fairway. One of several spots on Galveston's 32 miles of beaches is Stewart Beach at sixth and Seawall. The Park Board sponsors family-oriented events here such as volleyball tournaments, sandcastle competitions and concerts throughout the summer season. In addition, Amaze 'N Texas (a life-size human maze) and the Neptune's Kingdom Mini Golf Course are located at Stewart Beach. The three glass pyramids adjacent to Galveston Municipal Golf Course form the recognizable silhouette of Moody Gardens ((800) 582-4673), which is a themed nature park well worth a trip all by itself. The 10-story Rainforest Pyramid is home to the largest bat exhibit in the Southwest. There's also the IMAX 3D, the Discovery Pyramid, featuring science exhibits and the Garden's newest attraction, the Aquarium Pyramid. It's the largest of its kind in the world with 100,000 square feet of exhibit space. If you like vintage aircraft, check out the Lone Star Flight Museum ((409) 740-7722), located at Galveston International Airport. Meticulously maintained by a group of dedicated pilots and flight historians, the museum showcases one of the best collections of vintage World War II aircraft anywhere as well as a rare SR-71 Blackhawk and other jets. Most of the aircraft, including a B-17 bomber, Mustangs, B-25 and Douglas DC-3, are in working order and are featured in annual air shows. The back nine at Galveston Municipal Golf Course, by the way, provides front row seat to one of the local air shows, which this year took place in late April. Other attractions to check out include: the 28,000-square-foot Moody Mansion at 618 Broadway ((409) 762-7668); the 1893 Bishops Palace at1402 Broadway ((409) 762-2475); and the Railroad Museum at 25th and Strand ((409) 765-5700), which still has rows of undisturbed rail cars to explore outside a vintage train station. For local seafood, you can't beat Benno's Cajun on the Seawall ((409) 762-4621). Boiled crawfish with corn is a local favorite, but you can't go wrong with anything on the menu. The Cajun seafood platter, featuring grilled shrimp, oysters and fish with boiled potatoes is a must-try as is the homemade bourbon bread pudding. Shrimp n Stuff at 39th and Avenue O ((409) 763-2805, is also an island institution for local seafood and, like Benno's, it isn't fancy. Get in line, order, fork over payment and enjoy a po' boy or bowl of gumbo. For a more cultured experience, however, you might want to give 94-year-old Gaido's Seafood ((409) 762-9625) a try. Located at 3800 Seawall, Gaido's, known for its oyster platter, fresh shrimp and snapper and lobster bisque, is a little more formal than its sister restaurant, Casey's, which is located next door. Either way, Gaido's and Casey's are island traditions worth sampling.